6. Becoming More Than a Good Bible Study Girl in My Calling "
About "Becoming More Than a Good Bible Study Girl (Dvd)"
Are you tired of just going through the motions of the Christian life? Do you feel a tug at your heart to live completely for God---but you don't know what the next step is? In six enriching small group DVD sessions, Lysa TerKeurst helps you cultivate the spiritually exciting life you long for. For use with Participant's Guide. 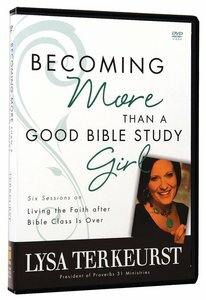 Join bestselling author Lysa TerKuerst for Becoming More Than A Good Bible Study Girl, a six-session, small group Bible study DVD that helps you figure out how to trade in going through the motions for the spiritual healthy and vibrant life for which you long. "?I really want to know God, personally and intimately.? Do those words resonate with you? You're tired of just going through the motions of being a Christian: Go to church. Pray. Be nice. That spiritual to-do list just doesn?t cut it. But what does? How do you step out of the drudger of religious duty to experience a living, moment-by-moment, deeply intimate relationship with God? - Build personal, two-way conversations with God. - Study the Bible and experience life change for yourself. - Cultivate great authenticity and depth in your relationships. - Make disappointments work for you, not against you. - Find incredible joy as you live out your faith in everyday circumstances.